Today was a strange day. It was beastly hot and humid, with a Mexican Monsoon effect. Having no air conditioning in our apartment—and living in an area that regularly gets hit by power blackouts—Martine and I decided to go to the Paley Center for Media in Beverly Hills. The lobby was crowded with young tourist couples seeing the displays about American Horror Story, a series on FX with which I was previously unacquainted. These guys (and their women) were heavily tattooed, wore their baseball hats backwards, did not know to flush toilets, and led with their smart phones taking pictures of everything in sight. I suddenly felt old. Here I was with a large group of young people that made me feel alienated. And here I was going to see a couple of Playhouse 90 episodes from 1959. I might has well have been talking in Armenian to a group of prairie dogs. Did I feel bad about that? In a way I did, though I would not have considered going far to seek common ground with them: The gulf between me and them yawned as big as the Grand Canyon. But I felt delighted with the Playhouse 90 episodes I saw, shot in consecutive weeks. The first was “The Town That Turned to Dust,” written and introduced by Rod Serling and directed by John Frankenheimer. The story was about a lynching in a small Texas border town called Dempseyville of a Mexican youth who was accused by William Shatner, as the local dry goods merchant, of beating up his wife Fay Spain and robbing the store. The sheriff who is powerless to prevent the lynching is Rod Steiger, in a powerful role, with James Gregory as a visiting newspaperman. The other was a dramatization of “The Great Gatsby” starring Robert Ryan as Gatsby and Jeanne Crain as Daisy May Buchanan. Rod Taylor was excellent as Nick Carraway. 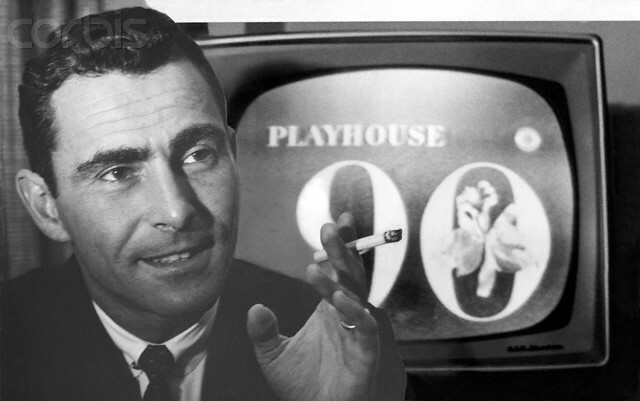 Rod Serling introduced the episode, which was directed by Franklin Schaffner. Although I do not watch much (if any) current television, I have a great deal of love and respect for the early days of the medium. Back at the beginning, they not only knew how to produce superlative entertainment, but used people who knew how to act, not just nod their heads meaningfully.